Yesterday G competed in his first powerlifting meet. I had no idea what to expect, but it was an exciting day. He weighed in on Fri night, but he still left early so he could get to the meet well before it started at 9am. The girls and I packed snacks, lunch, video games, paper, etc and got on the way. We arrived around 9:20 and settled in on the bleachers to see what was what. G was lifting on Platform 2 in flight E, basically this meant that he was in the second group on the platform to the left. We were in a high-school gym in south St Louis and they had 2 carpeted platforms setup with weights and the guys and gals that were competing took turns lifting on one of the two platforms. Each competitor got to do 3 lifts in each event they were competing in. They could either do squat, bench and deadlift, or just bench. If they didn't get a good lift in an event they couldn't move on to the next event. Squat was first, and this is G's favorite when he works out. On his first attempt he didn't get a good lift, because the spotter took the bar while he was still standing up so he had to do it over. Then on his do-over attempt he stepped forward when he came up which isn't allowed, so that was a failed attempt. On the second attempt he did much better and got a good lift at 451.9 lbs/205kg. On the third attempt he went up in weight but wasn't able to come all the way up -- so failed again. He got one good squat in and he moved on to the next event. Bench press was next, this is G's least favorite event -- his upper body isn't as strong and he doesn't like to do bench press. There are a lot of rules with the bench press. The feet have to be flat on the ground, the bar has to be lowered down to touch the chest, the lifters bottom has to stay on the bench. It's a lot and basically we just watched to see if they got white (good) or red (bad) lights from the 3 judges. 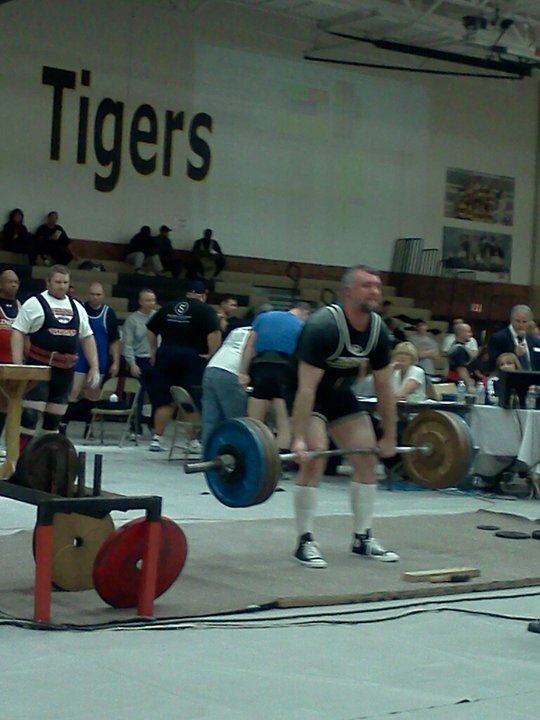 His 1st attempt was 242lbs/110kg, and 2nd attempt at 253lbs/115kg were both good lifts. 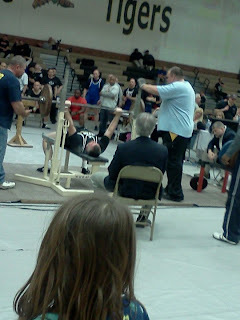 His 3rd attempt proved to be too heavy, so no go, but this time he got 2 out of 3 lifts and moved on to the next event. 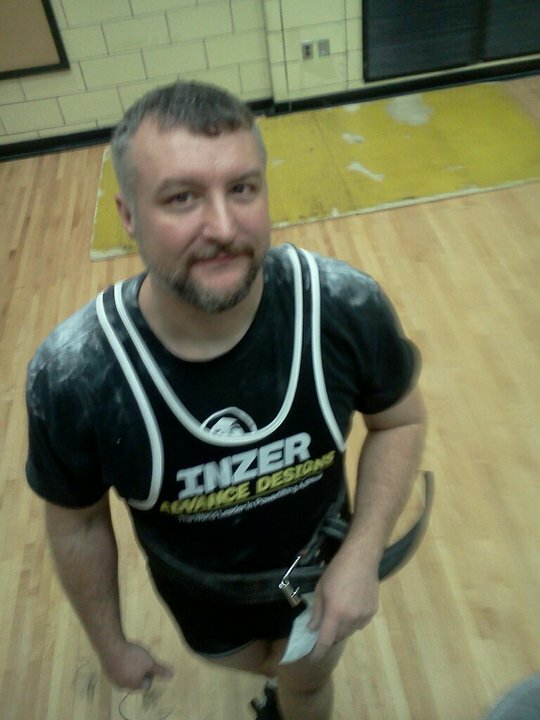 Then it was time for the last event - the deadlift. Overall deadlifts aren't as technical as the other lifts. Everyone seemed to get their first and second attempts so it really came down to that last lift and if they could hold on and stand all the way up. 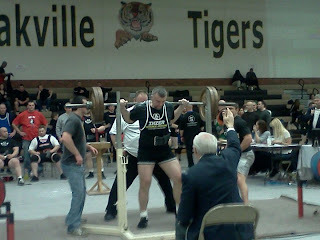 G got 2 out of 3 lifts, 1st was at 500lbs/227.5kg, 2nd at 540lbs/245kg, missed the 3rd. By the time G finished the deadlift it was about 3:30 and the girls were completely done sitting still, so we headed home. (Actually they hadn't been sitting still for a while, they were off to the side doing handstands and cartwheels off and on through-out the day.) G stayed to see the rest of the meet,to hear the final results, and to help load up the weights. Later, after we got home and had dinner G messaged me to tell me he'd gotten 3rd place in his age/weight group. He was really surprised, he didn't think he would place, but the girls and I are super proud of him. It's one thing to go to the gym and work-out on your own but it's another to put it out there in front of a bunch of people who live and breathe this type of thing. Some of these guys are hard-core, use all kinds of special gear to make the numbers go up, and spend all their time going to meets. G not only put up some respectable numbers (1245 lbs total), but he placed in his group. Good Job!